Crystal Light has a product called Iced Tea Peach Lemonade On The Go and it is by far one of the best alternatives to Diet Coke. I have always used this product, but I really started to get into it when I was trying to get off of Diet Coke. Diet Coke is great but all the carbonation caused me to bloat so I needed to find a better alternative. I stopped drinking Diet Coke for awhile, however I started to drink it again, due to a lack of self control. What gave me the idea to post about my new found love of Crystal light was my co-workers neice. She came in for take your family to work day and I gave her a pack to try, she LOVED it. She is only 7 years old, but I thought this is a great alternative for kids to have and maybe I should try to ditch the Diet Coke again and go for the lemonade. Lunch time is when you really see how someone is fueling their body and if they are getting the right nutrients from their food. 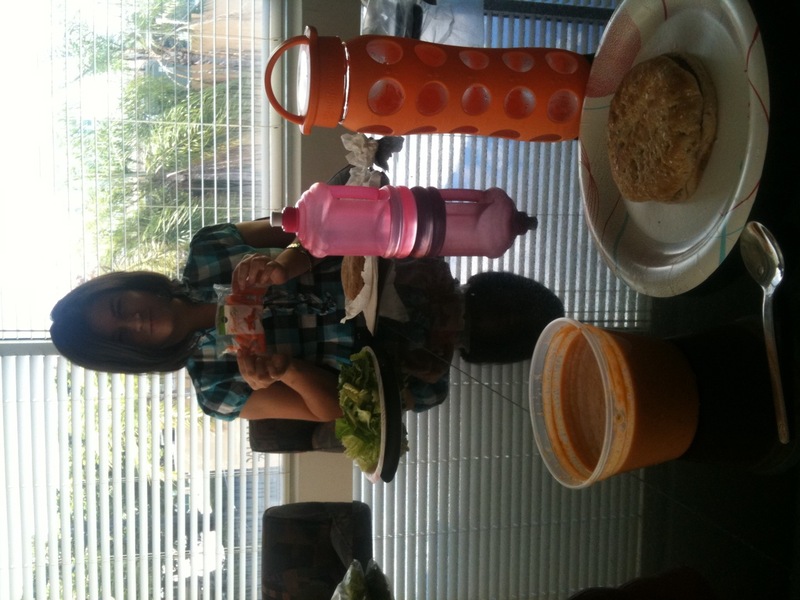 My competitor for “The Challenge” contest ate a plate of salad with carrots and a morning side chicken patty sandwich. In my opinion it did not look to appetizing ( I still luv you Aurora).